The exchange rate helps insulate the economy from aggregate demand shocks but it may need unsettlingly large changes to do so. This paper will examine the extent to which the exchange rate of a currency can be used to insulate an economy from aggregate demand shocks. First, it will define aggregate demand. 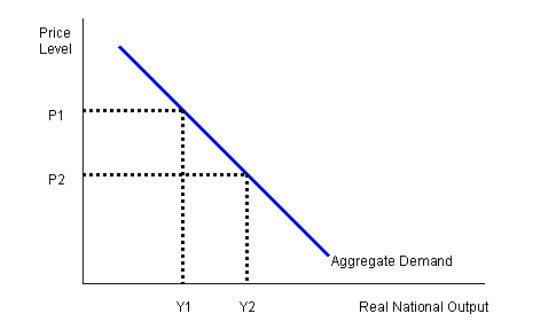 Second, it will look at the monetary implications of the aggregate demand curve. Thirdly it will look define aggregate demand shocks and their effect on the aggregate demand curve. Fourthly, it will examine the ways in which the exchange rate can be used to reduce the impact of an aggregate demand shock. Finally, the question of whether using the exchange rate as a means of reducing the impact of an aggregate demand shock will be examined to determine whether it is a feasible strategy and whether the amounts required would be unsettling or not. In the chart above, the AD ‘curve’ is represented by a negatively sloped line. If prices (P) are lower, demand (Y) is greater. This negative relationship between price and demand has a number of important monetary consequences. It is necessary to briefly examine these prior to examining the relationship between exchange rates and aggregate demand. Firstly, price levels (P) have a direct relationship to the real value of money. This is because as price levels (P) decrease, the purchasing power of consumers increases, meaning that the real value of the money they hold increases. Likewise, if P increases, consumers get less for the same money, or the real value of their money has decreased. Therefore, P and the real value of money are inversely related to each other. Thus, the higher p, the lower the real interest rate. Therefore, any increase in inflation will generally lead to pressure on the nominal interest rate to increase, to offset the deduction that will result from inflation. However, as we have seen above, price level decreases add to the real value of money, this is the same as saying that they decrease inflation. A decrease in inflation will mean that real interest rates are now higher than they were before the decrease in inflation. Therefore, price level decreases raise real interest rates and cause pressure for interest rates to be reduced. Thirdly, lower prices increase the international competitiveness of the economy, and this should be reflected in increased international demand for the economy’s exports, causing a rise in net exports and thus in the aggregate demand. Now we will look at aggregate demand shocks. A demand shock is an event that is sudden and unexpected, and has the effect of measurably affecting the demand for goods and services in the economy, either positively or negatively, for a temporary period of time. That is to say, the event shifts the AD curve, either to the right or to the left. A positive demand shock increases demand and shifts the curve to the right, resulting in higher prices. A negative demand shock decreases demand, shifts the curve to the left, and thus leads to a decrease in prices. Any number of events could constitute a demand shock, from an unexpected tax cut that increases consumer spending, to a dip in consumer confidence that decreases consumer spending. Likewise, an economic boom in for example China could result in higher exports to China, increasing demand. The danger of an aggregate demand shock is that they are a cause of uncertainty in the economy. Uncertainty makes it difficult for firms, government and consumers to budget properly and make the most effective investment and saving decisions. Both positive and negative demand shocks can be harmful, however, negative shocks are generally more feared. A negative demand shock, such as a drop in consumer spending, will lead to price decreases and the 2008 global financial crisis has been traced to such a demand shock in the US, which led to a fall in house prices, causing problems in the US subprime mortgage sector that then extended to the rest of the financial sector and wider economy. However, positive demand shocks, such as China’s increased demand for raw materials to fuel its economic growth have led to price increases in a number of important commodities that have also caused economic difficulties around the globe. Therefore, the consensus is that demand shocks of either type are dangerous and any means of dampening them available to governments are desirable. So could exchange rates be used to dampen a demand shock? A brief look at the relationship between monetary factors and the demand curve will demonstrate that exchange rates can be used to affect the demand curve. Therefore, in a positive demand shock, exchange rates could be used to decrease demand and in a negative demand shock, exchange rates could be used to increase demand. The relationship between two currencies may be nominal (e), or it may be real (RER). The real exchange rate takes into account variances in price levels in the two economies. P represents price in the domestic economy and P* the price in the foreign economy. The exchange rate can be used to increase or decrease the price of goods in the economy relative to other economies. This will in turn impact on the international demand for a country’s products. This will impact on the net export figure (NX). A higher exchange rate will decrease international demand and thus will pressure a demand curve towards the left. This could be used to temper a positive demand shock that had increased demand for goods and pressured the curve towards the right. Likewise, a lower exchange rate will increase international demand, increasing exports and shifting the demand curve to the left. This could be used in the event of a negative demand shock to reduce the impact of the shock. Basically, if any sector of demand changes rapidly, the government can seek to push exports in the opposite direction by making them more or less expensive. It is a simple idea and manipulating exports may be more desirable than manipulating other elements of demand, such as government spending, and may be easier to manipulate than, for example, consumer spending. Finally, the question must be asked, is the approach feasible? A central bank can quite easily impact on exchange rates by trading in its own currency. Buying will increase the exchange rate and selling will decrease the exchange rate. However, in order to move a currency value significantly, a central bank would be required to buy or sell a ‘significant’ amount of a currency. So what constitutes a ‘significant amount’ in the foreign exchange market? The global currency market is the largest and most liquid asset class in the world. The accepted size of this market in 2007 was generally put at about two trillion dollars a day. That would make it ten to fifteen times the size of the bond market and fifty times the size of the equities market. That means on a normal trading day, two trillion dollars passes hands. It would take an enormous amount of selling or buying by a central bank to make a dent in this market. A central bank that stepped in to buy or sell a couple of billion dollars worth of their currency would barely be noticed on the market, especially for the major currencies. And the question arises, how would a government fund such an intervention? It is also estimated that about 85 to 90 percent of the forex market is made up of speculators, meaning that attempts to manipulate exchange rates would be vulnerable to massive speculator bets which would have the power to undo any effect a government had on price movements. Also, given the side effects of exchange rate changes, such as the relationship of the exchange rate to inflation, it is likely that the cost of moving the exchange rate, just to get the indirect benefit of altering net exports, would outweigh the benefit. Therefore, it is concluded here that while exchange rates could be manipulated to insulate the economy from aggregate demand shocks, it amount of intervention required would be too large to justify the measure. Krugman, (1998) The Age of Diminishing Expectation, MIT Press: Cambridge MA. Romer, D., 1996. Advanced Macroeconomics. McGraw Hill: New York. "Effect of Exchange Rate on Aggregate Demand Shocks." UKEssays.com. 11 2018. All Answers Ltd. 04 2019 <https://www.ukessays.com/essays/economics/effect-exchange-rate-aggregate-demand-8724.php?vref=1>. "Effect of Exchange Rate on Aggregate Demand Shocks." All Answers Ltd. ukessays.com, November 2018. Web. 23 April 2019. <https://www.ukessays.com/essays/economics/effect-exchange-rate-aggregate-demand-8724.php?vref=1>. UKEssays. November 2018. Effect of Exchange Rate on Aggregate Demand Shocks. [online]. Available from: https://www.ukessays.com/essays/economics/effect-exchange-rate-aggregate-demand-8724.php?vref=1 [Accessed 23 April 2019]. UKEssays. Effect of Exchange Rate on Aggregate Demand Shocks [Internet]. November 2018. [Accessed 23 April 2019]; Available from: https://www.ukessays.com/essays/economics/effect-exchange-rate-aggregate-demand-8724.php?vref=1.